Those are instructions we can embrace as we make the choice to walk according to the Spirit. We don’t hear about having courage for everyday life very often. And we don’t think much about it being a character quality that we want to foster. 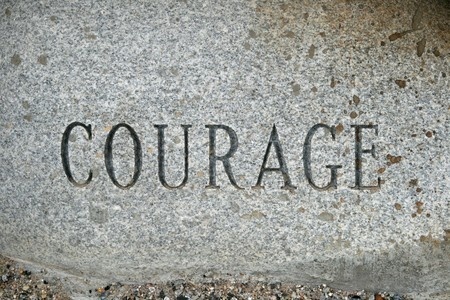 But courage, especially in today’s chaotic and challenging times, is a powerful tool we all can use. Courage is “the mental or moral strength to venture, persevere, and withstand danger, fear, or difficulty.” And when we mix courage with faith . . . the combination is unstoppable. Our courage is a product of our trust in God and His Word, just like the Lord revealed to Joshua. So we want faith driven courage. And when we feel fear coming on, we can pause and remember these instructions . . . and make the choice to trust God and be of good courage. There is a cousin to the word courage . . . and that it “encourage.” The etymology (study of words) of the word encourage excites me and challenges me to be an encourager. “En” means “to put in.” So when we encourage people, our words and actions serve as a channel to put courage into their lives. Another example of the power of encouragement is illustrated in David’s life, “And David was greatly distressed; for the people spoke of stoning him, because the soul of all the people was grieved, every man for his sons and for his daughters: but David encouraged himself in the Lord his God.” 1 Samuel 30:6 By focusing on God and His Word, David was able to muster courage so he could face the challenges that were before him. Again, faith-based courage gave him the strength he needed. What do these examples call us to do today? First, we are to foster courage in our own hearts by choosing to trust God and believe He will work in our lives as we follow His teachings. And then, we can also choose to encourage those around us . . . and encourage ourselves . . . all according to the ways of God. Encouragement doesn’t mean we sweep issues under the carpet or avoid challenges. Instead, we want to encourage others and ourselves to trust in God, to follow His teachings, and to move into the circumstances without fear. Whatever you are facing today, I encourage you to “be of good courage and do not fear.” Trust in the Lord. Believe in His Word. And walk out in faith as a well-equipped child of the Most High! ← Seek the Lord with All Your Heart . . . really?